What makes a speaker tube friendly? Many of our customers are tube enthusiasts (or aspiring tube enthusiasts), hence one of the most common questions we are asked is "Will my speakers run on tubes?" Many consumers are confused, and others clearly misinformed, regarding what characteristics of loudspeakers yield a "tube friendly" design. We have been unable to find a good, concise discussion of these characteristics online and as a result have decided to write one ourselves. This article will provide a basic explanation as to why some speakers work well with tube amplifiers while some do not. One misleading piece of information with which our customers are often provided is sensitivity. This specification is commonly misrepresented as "efficiency" which it most certainly is not. Loudspeakers are terribly inefficient and it is likely that virtually no consumer has ever been given an actual efficiency specification. The most efficient loudspeaker designed to date was the Altec Lansing Voice of the Theater, which had an efficiency rating of approximately 3.6%. No loudspeaker manufacturer would ever publish an efficiency specification because it would discourage and mislead consumers. Be clear on one point: sensitivity and efficiency are not the same thing. Even when using a solid state amplifier, one cannot necessarily equate high sensitivity to high efficiency - the physics are simply more complex than many manufacturers, and sadly reviewers, lead us to believe. Instead of efficiency, loudspeaker manufacturers provide a sensitivity specification. This figure is supposed to indicate how loud a speaker will play when fed one watt of power, or 2.83 volts, listening from one meter away. The problem with this measurement is that the conditions under which it is to be recorded are not well defined and hence the figure does not provide a consistent "apples to apples" point of reference. For one thing, the input sensitivity (gain) of the amplifier used to measure the sensitivity is unknown and unspecified. More importantly, while the specification calls for measurement at one meter away, the conditions of the listening room are not defined. It is not clear whether measurement is to occur in an anechoic chamber, a concert hall, a coat closet, or a gymnasium. Each of these rooms will yield remarkably different sensitivity readings at one meter from the speaker. Impedance, Phase Angles and Back EMF... Oh My! Impedance, for the purposes of this discussion, may be thought of as the AC equivalent of DC resistance. As a result, Ohm's law is applicable: in a circuit the product of impedance and current is voltage (conventionally represented as V = I x R) which in the case of a loudspeaker-amplifier circuit is constant. In other words, as impedance rises, the current required from the amplifier to maintain the circuit's voltage decreases. More importantly, as impedance lowers, the current required increases. This concept is important for both tube and solid state amplifiers, as will be explained in greater depth later. 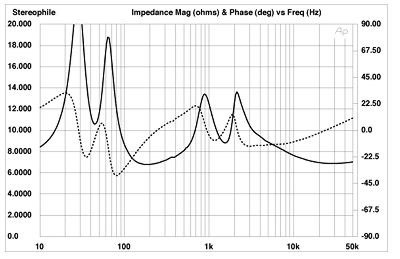 Virtually all speaker manufactureres publish a "nominal" impedance rating for their speakers. The term nominal ought to indicate the optimistic and relatively unscientific nature of the figure provided. Many speakers are rated nominally at 8 ohms but their impedance fluctuates wildly over the audible frequency spectrum. 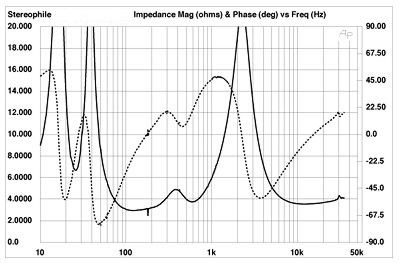 Knowing the nominal impedance is simply insufficient to determine how well a speaker will perform on tubes. Many tube enthusiasts state that a speaker must be nominally rated at 8 ohms or higher in order to be tube friendly - this is an oversimplification and will be clarified later. Bear in mind that the nominal impedance is only a useful figure in the context of the minimum impedance. Ideally a graph of a given speaker's impedance vs. frequency, will be available. In the graph above, the solid line represents impedance, and the dashed line phase. Frequency is measured along the horizontal axis in Hz. Impedance is measured in ohms on the left hand vertical axis. Phase is measured on the right hand vertical axis in degrees. Also worth discussing is the measurement of phase on the above graph. Phase is measured in degrees. The greater the angle in the positive direction, the more inductive the loudspeaker becomes, the greater the angle in the negative direction, the more capacitive. 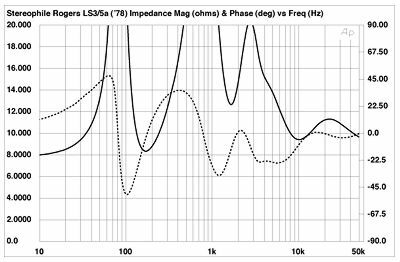 The above speaker's phase angles are actually not as steep as some others we have seen, but one important consideration is that the speaker is fairly capacitive at around 80 Hz., where the speaker's impedance is about 4 ohms. The combination of low impedance and high capacitance requires that the amplifier generate large amounts of current at that particular frequency. Tubes like a resistive load - it's really that simple. A resistive load translates to a flat impedance, and an inductive rather than a capacitive phase angle. A less technical way of looking at an ideal speaker from a tube's point of view is as follows: tubes like consistency. They prefer a speaker that doesn't swing from 8 ohms to 2 ohms and back again. If the impedance is going to dip it should do so gradually, or in small dips. Tubes like a steady load - capacitance is the opposite. When a speaker behaves in a capacitant manner, it presents an uneven load to the amp, asking for current in sudden spurts. Tubes don't like to pump out current at the drop of a hat. They prefer a consistent and predictable load. Naturally it is sometimes difficult for speaker manufacturers to keep all the aforementioned variables in their ideal ranges. If phase angles must be capacitive, impedance should be high. The lower the impedance, the flatter it must be, and the less capacitive the phase angles must be. 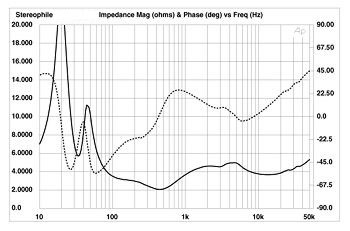 All three variables (slope of impedance, value of impedance, value of phase angle) together determine how good a match a speaker will be for a tube amp. For this reason, the argument that only speakers with an impedance of 8 ohms or higher will work on tubes is incorrect. There are many tube friendly speakers whose nominal impedance is 4 ohms. If the speaker's impedance is relatively flat and consistently hovers around 4 ohms, and if the phase angles are only slightly capacative, or better yet inductive, there is no reason why a 4 ohm speaker cannot perform well on a tube amplifier. Some of our favorite tube friendly speakers are 4 ohms! It is also important to recognize that one need not use the 4 ohm taps on a tube amp with 4 ohm speakers. Many 4 ohm speakers sound their best when hooked up to 8 ohm, or even 16 ohm taps. If the speaker presents a resistive load (i.e. the impedance is flat - even though it is low) the 8 or 16 ohm taps will work fine, and always sound better than the 4 ohm taps. If the speaker requires more current because the impedance is low and and not terribly flat, the 4 ohm taps will likely offer better bass control at the expense of definition in the highs and mids. We encourage you to try your speakers on each of the output taps and hear for yourself the difference. If the above explanation seems complicated, let's take a look at some more graphs. Visualizing our explanation will make it much simpler to grasp. Let's start with some graphs of speakers that we know are excellent matches for tubes. The above graph is of a Rogers LS 3/5a, a notoriously tube friendly speaker. While the impedance is not flat it is consistently high, never dipping below 8 ohms, and often peaking above 20 ohms. The result is less current demand on the amplifier in question. At the same time, the phase angles for this speaker are only slightly capacitive, with the exception of the dip at around 110 Hz. However, notice that the corresponding impedance is extremely high, thus somewhat marginalizing the effects of capacitance. 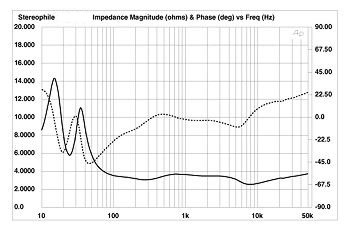 The tendency of a speaker's impedance to peak when the phase angles dip is a trend found in many tube friendly speakers. Remember our discussion of sensitivity and how misleading it can be? Rogers LS 3/5a's have a measured sensitivity of 82 db/watt. Yet they are some of the most tube friendly speakers ever designed. The Rogers LS 3/5a is one of the best examples in our industry of a low sensitivity loudspeaker with a high, flat impedance and relatively benign phase angles which mates beautifully with tubes. Above is the impedance graph for another very tube friendly loudspeaker (whose sensitivity is published as 86 db/watt). Again we see the trend of a consistently high impedance. This speaker is rated as 8 ohms nominally and its impedance never dips much below 6.5 ohms. The phase angles for this speaker are even better than those for the Rogers, with only one small saddle at around 80 Hz. measuring less capacitive than in the Rogers, and again we see that the corresponding impedance is quite high. This speaker has a published nominal impedance of 8 ohms, which might be a little optimistic but nevertheless it only dips below 6 ohms briefly on a couple of occasions and when it does so, the phase angles are either slightly capacitive or inductive. What we see here is a speaker whose published nominal impedance (8 ohms) bears little relation at all to its actual impedance. For large spreads of the audible bandwidth this speaker measures under 4 ohms. Likewise at around 55 Hz. there is a very steep capacitive phase angle which intersects with a low impedance. Taken together these two factors place very substantial demands on the amplifier. This speaker has a published sensitivity of 91 db/watt. Is it clear now how misleading sensitivity can be when selecting a tube-friendly speaker? Of all of the speakers we have measured thus far, the one with the highest sensitivity has been the worst choice for tubes. In this case the problem is really quite simple - the measured impedance for this speaker is unrealistically low throughout the vast majority of the audible frequency spectrum. From 80 Hz. to 50 kHz. this speaker measures under 4 ohms, and at several points it drops to 3 ohms. Even though the phase angles are relatively harmless, the impedance is so low that only a high inductive load would make a difference. This speaker requires an amplifier stable into very low impedance, and which is capable of outputting large amounts of current on demand. In this example what we see is an impedance which mimicks a rollercoaster - up, then down, then up, then down again. A giant peak between 1 and 5 k, on either side of which we measure impedance under 4 ohms guarantees erratic performance with tubes. As in past examples we also see a relatively capacitant phase angle intersecting with a fairly low impedance, demanding high current output from the amplifier. 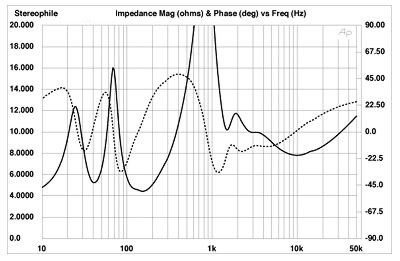 Back EMF is one variable which is difficult to gauge from impedance graphs but contributes significantly to how tube-friendly a given speaker will be. Consider for a moment how a loudspeaker operates: an amplifier excites a loudspeaker driver by sending it current. Now look at the process in reverse: if you excite a loudspeaker driver (by pushing on it gently, for example) you will send some current from the speaker to the amplifier. You have simply reversed the circuit. Back EMF may be thought of in this context. Thus we know that when the amplifier is sending current to the speaker, and the speaker's driver's are moving, current is coming back from the speakers to the amplifier. Mathematically the amplifier sees this current as negative current because it flows in the opposite direction of the current it is sending to the speaker. The simplest way to think of Back EMF is to associate it with a net reduction in the loudspeaker's impedance. Back EMF is most severe with poorly damped woofers. As a result, if a speaker sends large amounts of Back EMF back to the amplifier, it will typically do so when reproducing lower frequencies, for those frequencies are where larger drivers reach their peak of excursion. Thus it is common to find speakers which perform well on tubes except for when music with a lot of bass information is played, at which point the speaker falters and the sound degrades quickly. This is simple the result of the bass frequencies exciting a large, "floppy" driver which in turn generates Back EMF and lowers the impedance. Hence some trial and error is in order. 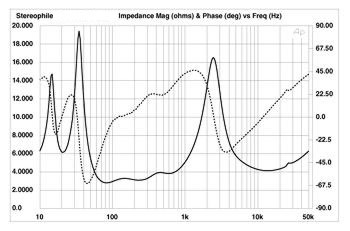 Simply glancing at an impedance graph will not always guarantee that a speaker is a good match. An impedance graph does not show the effects of Back EMF because Back EMF varies considerably based on the source material used. At the risk of repeating ourselves, much as one cannot simply judge the quality of a speaker by staring at its impedance graph, one cannot pass judgement on the sound of a speaker based on how much Back EMF it generates. All of the variables we have discussed in this article simply relate to how tube-friendly a given speaker will be, and hence how good it will sound when driven by tubes. A speaker with a low impedance, high capacitance, and significant Back EMF may sound fabulous on the right amplifier. But an important consideration when optimizing the sound of that speaker would be choosing an amplifier which can adequately handle the demands placed upon it by such electrical characteristics. Solid State Can be Picky Too! Let's discuss solid state amplifiers for a moment. It is important to understand that our entire discussion of impedance and Back EMF applies to all amplifiers, not just tube amps. Not all solid state amps are well suited to a speaker whose impedance dips below 4 ohms Some amplifiers make use of circuitry which is referred to as "current limiting" which simply means that as a speaker presents a lower and lower impedance to the amplifier, the amp actually decreases current output. For many amplifiers, current output is limited into loads lower than 4 ohms. What this means, essentially, is that a speaker whose impedance dips below 4 ohms for substantial portions of the audible spectrum will not be driven to its full potential by a current limiting solid state amp. This is why in our discussion of sensitivity we stated that a high sensitivity does not guarantee that a speaker will play loudly, even when driven by a solid state amplifier. Given a speaker with extremely low impedance, on the wrong solid state amp, you will hit a ceiling past which you simply cannot play regardless of sensitivity. Which amplifiers are current limiting? That is a question your dealer should be able to answer, and if not the amplifier's manufacturer certainly can. The reason that so many cheap receivers and amplifiers are unable to generate deep bass is that they have current limiting circuitry which prevents them from sending low frequencies at low impedance. Hence when connected to speakers with low impedance, particularly in the lower frequencies, these receivers or amplifiers will sound thin in the bass regions. Current limiting is not necessarily a bad sign: many wonderful solid state amplifiers make use of current limiting circuitry. Selecting speakers that will sound best on a current limiting solid state amplifier is a similar process to selecting speakers for a tube amplifier, although one need not be quite so rigid in one's criteria. Typically solid state amplifiers, even those which are current limiting, are more immune to high capacitance than tube amplifiers, and large swings in impedance are less important so long as the minimum impedance remains above a reasonable value such as 4 ohms. Back EMF tends not to be a concern with solid state amplifiers unless the speaker has a low impedance and sends substantial amounts of Back EMF to the amplifier. For those speakers which present more difficult loads with extremely low impedance, solid state amplifiers which use "current dumping" circuitry should be chosen. Current dumping amplifiers continue to output more and more current until the impedance is vanishingly low. Typically such amplifiers will only shut down when a short is presented, or when they reach thermal instability. We carry both current dumping and current limiting solid state amplifiers, and this is why even when a customer wishes to purchase a solid state amp, we are careful to ensure that it is an appropriate choice for his speakers. Dual-mono imaging, i.e. the speakers do not "dissappear"
The above traits are exaggerated on SET amplifiers. Some speakers are push-pull friendly but not SET friendly. Push pull amps, even with low power ratings, are typically capable of driving more demanding or capacative loads than SET amps. If in doubt, audition the amp and speakers you plan to buy together before you buy them. As you can see, an understanding of audio equipment's measurable characteristics is fundamental to building a good hi-fi system, regardless of whether you plan to use a tube or solid state amplifier. It is difficult to make generalizations about the quality of a given speaker or amp in terms of its measurements. There are many wonderful sounding loudspeakers which present extremely demanding loads and are simply ill-suited to tube amplification. On the other hand, there are speakers which are easily driven and present benign loads but which are perhaps not the finest examples of acoustic engineering to be found in our industry. As has been discussed at length in magazines and forums for years, one cannot make a simple connection between measurements and performance. Nevertheless, we believe that to ignore measurements is to limit the performance of one's equipment. We welcome you to stop by Symphony Sound and listen to the difference proper component matching can make.